It was so difficult to know how to preach this passage from Luke. So many horrible things have happened in the last few weeks. God did give me the words for God's people at St. Timothy and St. Mark Lutheran churches. Much thanks is owed to David Lose and his insights. 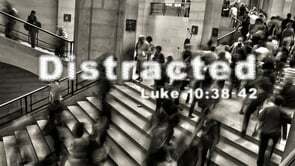 The text was Luke 10:38-42. I preached this on Sun., 7/17. Does Jesus seem a little mean to Martha? After all, Martha was taking on the role that was expected of her in first century Palestine. She was being a good hostess. When we are hosting an important guest, don’t we want everything to be just so? After all, we want to make a good impression, don’t we? We want people to have such a wonderful meal and visit that they will want to come back. Martha had become less concerned with Jesus, her guest, and more concerned with her tasks. It was not a matter of what she was doing, but how she was doing it. She became task focused rather than Christ focused. Listen to Martha’s complaint to Jesus: “Lord, do you not care that my sister has left me to do all the work by myself? Tell her then to help me.” Who is at the center of Martha’s words? Is it Jesus? Lord is only mentioned once. Is it about Mary? She’s only referenced twice. It is about Martha! Me and myself are prominent words in this complaint. There are three me-isms. Something is wrong with those proportions—Jesus once and Martha three times. V. 38 suggests nothing negative about the nature of Martha’s welcome, it is with respect to her hospitality that she is contrasted with Mary. Service is normally something good, but hers was marked with distractions and worry. How scandalous Mary’s actions were! Middle eastern homes of that time (and in villages today) were divided into different areas. There was a common room where visitors were received. That was the male domain. The women congregate in a separate area in the house. When I was a missionary in Palestine and visited homes of the local people, I was entertained in the common room normally reserved for men. I only got to be entertained there because I was foreign and with a group that included men. When we would eat together, the women were absent, except to serve. They did not eat with us, but ate by themselves in the kitchen. By spending time with Jesus, Mary had done far more than breached the etiquette of her day. Mary had crossed the line. She was in a part of the house she should not have been. Mary was playing a decidedly male role by sitting at Jesus’ feet. Now that expression conjures up in my mind the image of the RCA dog who heard his master’s voice. However, the fact that Mary “sat at [Jesus’] feet and listened” meant she was acting as Jesus’ student. To sit at the feet of a rabbi like Jesus, meant that Mary wanted to be a rabbi herself (N. T. Wright). Now that’s nervy! Remember that in our own denomination, women have only been ordained since1970. Think about a patriarchal middle eastern society in the first century and you can imagine just how scandalous Mary’s actions were. No wonder Martha wanted Jesus to put Mary in her place. But there’s the problem. Jesus loves to turn everything upside down. Rather than calling Mary on the carpet, Jesus commends her choice. It’s easy for us to look at Martha as a model someone who totally missed the point and should have been doing what Mary was. We see Mary as the example of a good Christian and the type of person Jesus calls us to be. But that is not the point. God calls us to work and to pray and listen to God’s voice. It’s not a matter of either/or, but both. As St. Benedict taught, our work is our prayer and our prayer is our work. Is God asking us to abandon hospitality, good works or the daily tasks of life that we must attend to? NO!!! God is looking for us to do what we have to, but not to let them be all consuming. Writer Joel B. Green sums up God’s call to us in this way, “The welcome Jesus seeks is not epitomized in distracted, worrisome domestic performance, but in attending to this guest whose very presence is a disclosure of the divine plan” (Joel B. Green, The Gospel of Luke, p. 434). One thing is needful and that’s to really know you. For without you Lord where would I go? To sit at your feet and hear the words that you speak to my heart. In light of all the events of this week, the killings in Nice, France and the attempted military coup in Turkey, as well as the events of last week, one may wonder how do we relate those events to today's gospel of Mary and Martha? I believe that some of the protests we have witnessed in this country are a plea for segments of our society who have not been seen to be noticed by the dominant forces in our society. And it doesn’t stop there. The massacre in Orlando, the resistance to admitting refugees to our country, the fear-mongering that has plagued this election, all of these are a result, in part, from our penchant to hold so steadfastly to our own cultural norms and expectations that we refuse to see others as God does and cannot see the new possibilities God is still unfolding before us. What do we see? Whom do we see as worthy? How do we see ourselves? How do we see others? At times, even, do we see others at all? (These questions and themes resonate with our discussion of the parable of the Good Samaritan from last week as well, God is calling us to look upon someone as worthy and imagining a different way of regarding an outsider (David Lose). The world is on their way to You but they're tripping over me. It is our role as a church and as Christians to eliminate the barriers between people, not to erect them..